December 31, 2007: GSU patrols and citizens were engaged in running battles in Nairobi since Sunday. BBC the British media service reports that at least 103 persons are dead in post election violence. 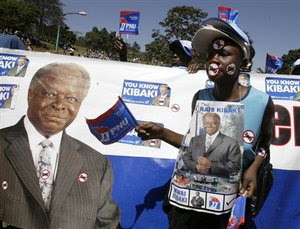 On December 30, 2007, the Electoral Commission declared Mwai Kibaki winner of December 27's general election plunging the country into chaos after the runner up Orange Democratic Movement declared victory. Kibaki was declared the winner with 47% of the vote ahead of Raila Odinga's 44%. In Parliament, ODM will be the largest political party with nearly 100 MPs compared to Kibaki's PNU and affiliates that have about 75 MPs. Third place finisher's Kalonzo Musyoka's Orange Democratic Movement of Kenya has 18 MPs. The balance of power depends on the final returns from about 20 constituencies. 20 MPs will be nominated a tally that will push ODM's parliamentary contingent to at least 110 MPs. Ethnic violence between the Kikuyu and the Luo has spread across Nairobi the capital and Kisumu, Kenya's inland coastal city and capital of Nyanza province. The Electoral Commission of Kenya headed by former KANU MP Samuel Kivuitu announced results on State TV shortly before the swearing in ceremony at State House Nairobi.